Easton has made their standout Elite Hip Quiver even more functionally diverse with the introduction of the Elite in a takedown version. The Army Corps of Engineers issues a small craft advisory for the Arkansas River beginning at Murray Lock and Dam and continuing downstream. Recent rains in Arkansas and Oklahoma have caused flows to rise. Alaskan fishing groups and businesses, tourism businesses, and tribes representing thousands of Alaskans today signed a letter to Governor Dunleavy urging him to seize “the best opportunity in 20 years to obtain real action from British Columbia to clean up and close down” the Tulsequah Chief mine. To commemorate its tenth anniversary, the Quail and Upland Wildlife Foundation and apparel manufacturer Propper International have teamed up to create an exclusive line of clothing for members, sponsors and supporters. The Nebraska Game and Parks Commission is excited to announce The Take ‘Em Fishing Challenge, a new summer-long, statewide challenge in which anglers can win great prizes just by sharing their love of fishing. Umarex USA is honored to announce that T4E will showcase its line of training products at the NYTOA Tactical Training Conference and Expo, April 16th-19th, in Verona, New York. Even though conditions are setting up well for the spawn to play a role during the upcoming Bassmaster Elite at Winyah Bay, traditional sight fishing tactics may not be the only option for the 75-angler field. Bullet Weights® congratulates Jeremy Lawyer on winning the FLW Tour at Grand Lake presented by Mercury Marine on March 28-31 in Grove, Oklahoma. Applications are now being accepted for matching grants from the Land and Water Conservation Fund, which recently became permanently reauthorized. GLOCK, Inc. announced legendary world champion martial artist, actor, producer, philanthropist and entrepreneur Chuck Norris as the company spokesperson. Chattanooga Shooting Supplies, Inc. announced appointment to two new members to the Board of Directors. One is Todd Seyfert, CEO of FeraDyne Outdoors and the other is Matt Buckingham, VP of Manufacturing for Precision, Inc.
Bill Hicks & Co., Ltd., a distributor of wholesale sporting goods, today announced the promotion of Evan Ranz to Senior Purchasing Agent. Evan’s primary focus is on optics, ammunition, suppressors and shooting sporting accessories. Lure Lock has retained Kolder Canada as its sales agency of record in Canada to accelerate the growth of Lure Lock in the Canadian market and bring the popular line to anglers all across Canada. Zach Kienbaum, one of the most decorated sporting clay target shooters in the world is now a member of Team Winchester. Highby Outdoors, a leading ecommerce, outdoor sporting goods store is pleased to announce that they have seen stellar sales growth in their first 45 days in the market. Ridge Ridge Outdoor Media now has immediate full-time openings for Corporate Sales Agents, and is looking to hire quality sales agents active in the shooting and outdoor industries, that want to get off the road and work from a home-based office. The COVERT™ Four-Pin bow sight from Apex Gear is a hybrid sight system that delivers the advantages of multi-pin systems and moving aperture sights; this year the sight is even more versatile with the introduction of a new option. Installing an optic on a semi-auto handgun used to require sending the slide out to be machined to accept the optic—a costly operation that permanently altered the handgun slide. Now there is a better way, thanks to the new Pistol Red•Dot Sight Mount from TRUGLO®, Inc.
Vermillion-tinted lenses are part of Honeywell’s SCT Spectrum Control TechnologyTM family. All Howard Leight by Honeywell Uvex shooting sports lenses absorb 99.9 percent of ultraviolet radiation. Sea Eagle Boats delves deeper into the fishing category with the new SUPCat10 inflatable fishing SUP, a 10’ double pontooned craft can reach speeds up to 8 mph with just a 3 hp gas engine and 4 mph with a 70 lb. thrust electric motor getting you to the fish faster than any SUP or kayak on the market. The Nebraska Game and Parks Commission will conduct prescribed burns on wildlife management areas (WMA), state recreation areas (SRA) and state parks (SP) when conditions are favorable through May 15, according to Pat Molini, Wildlife Division assistant administrator. Mossy Oak GO is now streaming “NRA Country Spotlights,” a brand new series to the free digital streaming platform. Dale Hall, chief executive officer of Ducks Unlimited, was named the 2019 LSU Alumnus of the Year. Hall, who is retiring from Ducks Unlimited in June, was inducted into the LSU Alumni Association Hall of Distinction April 5. RAFD is proud to announce and welcome Donise Petersen as the Chief Operating Officer. Donise will be responsible for the non-profits organization including the growth and implementation, as well as general management and responsibilities. Arizona Mule Deer .Org announces the addition of two new members to their Board of Directors: Kevin Hall and Larry MiCormick. A settlement has been reached in a class action lawsuit claiming that certain Rossi brand revolvers are defective in that they could unintentionally fire when dropped. The Defendants Forjas Taurus, S.A., and BrazTech International LC (doing business under the brand "Rossi") issued a Warning about these safety concerns in September 2018. Bear Archery recently confirmed their long-standing support of youth archery by naming the Scholastic 3-D Archery Association as the recipient of a 2019 sponsorship. The Association of Collegiate Anglers (ACA) is pleased to announce that Boat Owners Association of The United States (BoatUS) is continuing its Title sponsorship of the 2019 BoatUS Collegiate Bass Fishing Series Championship. The Maryland Department of Natural Resources is offering free tree seedlings to Wicomico County landowners who have a creek, drainage ditch, stream or other waterway on or near their property through the Backyard Buffers program. The Maine Department of Inland Fisheries and Wildlife has honored longtime Maine guide Bonnie Holding of Coplin Plantation with the Wiggie Robinson Legendary Maine Guide Award. Indiana Conservation Officers arrested a Harrison County couple on the evening of April 4 after they were caught illegally digging for artifacts along the Ohio River. The pair were charged with DNR archaeological violations, methamphetamine manufacturing, illegal ginseng possession, and illegal wildlife possession. This week on Deer and Wildlife Stories with Keith Warren, we discover a research program on the deadly deer disease EHD being conducted at the University of Florida. This research will help whitetail deer enthusiasts around the country. SIG SAUER Academy announced the addition of Women’s Concealed Carry to the 2019 Course Schedule. This unique curriculum was written and designed by female instructors whom have carried firearms for years as law enforcement officers and nonsworn citizens. After a five-year hiatus, the Scholastic Action Shooting Program announces the SASP Junior Olympic Development Camp (JODC) is back. In the first global test of the idea, scientists have found evidence that some woodpeckers can evolve to look like another species of woodpecker in the same neighborhood. The researchers say that this "plumage mimicry" isn’t a fluke—it happens among pairs of distantly related woodpeckers all over the world. Recall, Bulletin, Advisory: What's the Difference? SPRINGFIELD, VA -- Safety recall, service bulletin, product correction bulletin, service advisory: What do these terms mean to you? Some use the force of law to require manufacturers to repair defects. Some are manufacturers’ goodwill offers for free repairs, and the others are simply internal notifications that may not be much more than an “FYI.” Here’s what each means to recreational boaters. If a manufacturer goes out of business before the recall can be addressed, you are out of luck. If a new company buys the old business, however, it may be responsible for the repairs or it may repair the defect simply as a goodwill gesture. “Product Correction Bulletin” vs “Service Advisory” vs “Service Bulletin”: With issues that don’t pose an imminent threat to life and limb but can be dangerous, a manufacturer may issue a “product correction bulletin.” Repairs are generally at no cost to the boat owner. A “service advisory,” like the “product correction bulletin,” is a notice to a boat or engine owner that a Product Improvement Program (PIP) may be available that allows a dealer to be reimbursed by the manufacturer for a number of hours of labor, much like a warranty reimbursement, even if the product is out of warranty. This, too, is generally at no cost to the boat owner. A common reason manufacturers issue “service bulletins” is for a product improvement or software updates. The costs of these types of repairs are often borne by the boater, but sometimes manufacturers help dealers so repairs can be done at little or no cost to the owner unless past the official “close date.” Even then, some manufacturers have been known to extend close dates as a goodwill measure. 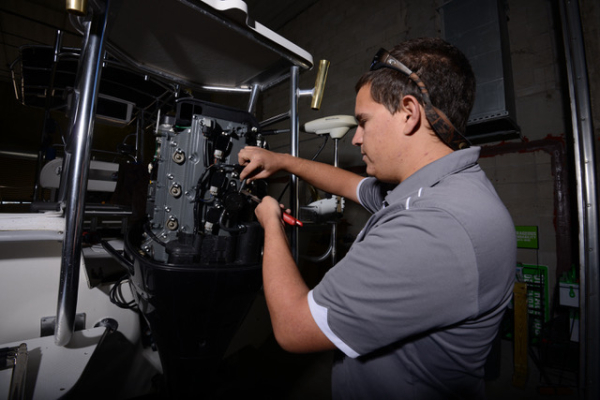 Some “service bulletins” are directed to boat dealers for the purpose of helping manufacturers troubleshoot a problem that may or may not be covered by warranty. Other “service bulletins” may be guides for both dealers and boat owners detailing proactive measures to prevent problems. Regardless, if it is a “service bulletin,” “product correction bulletin” or “marine service advisory” and the repair is free, associated costs such as haulouts or travel aren’t typically covered. If labor costs exceed the hours the manufacturer is reimbursing the dealer, those costs may also be passed on to the owner. How to check your boat for recalls: Manufacturers are required to contact the original owners of boats or products to advise of a recall, so new boat owners should always register the warranty so they may be contacted. Once a boat is resold, it becomes more challenging for manufacturers to remain in contact with subsequent owners. Regardless of the boat’s age or which owner you are (second, third …), contact the manufacturer and let it know you’re now the owner. The easiest way to find out if there is or was a recall for your boat, engine, or accessory is to visit the U.S. Coast Guard’s recall website at uscgboating.org/content/recalls.php. If your boat is on the list, contact the manufacturer, which can check records to see if the repair has been done. If not, it can direct you to a dealer that can do the repair. Again, some expenses such as haulouts are usually not included. In addition, BoatUS Consumer Protection offers BoatUS members free access to the BoatUS Complaint Database, the only national database devoted solely to problems involving recreational boats, marine engines, and related products and services. To join, go to https://www.boatus.com/membership/.